There’s no better time to make pesto than when your garden is overproducing herbs at the end of summer. 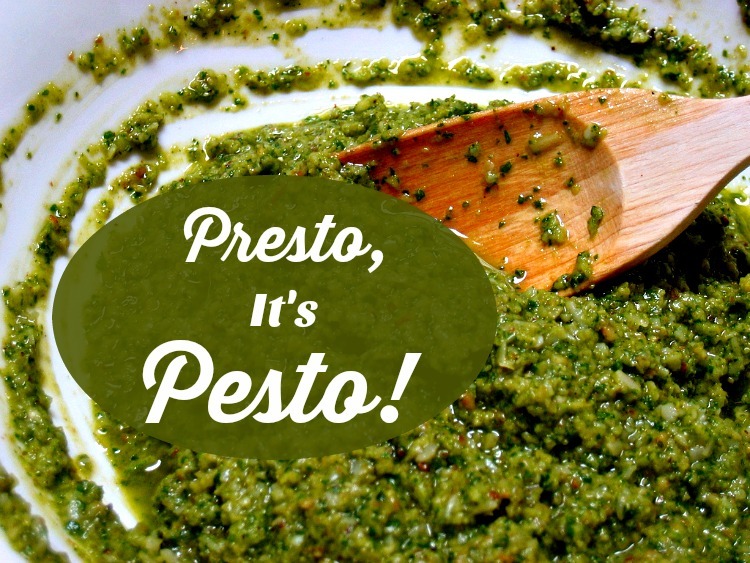 Of course, pesto is delightful anytime! But buying herbs in large quantities at the supermarket off-season can get expensive. So take advantage of those garden herbs now, when they’re practically free! Pesto is a great way to preserve your herbs, too, so you can enjoy them long after your garden has stopped producing. The homemade kind keeps about two weeks in the refrigerator and can be frozen for up to four months. Pesto is exquisite tossed with pasta, dolloped on steamed veggies, folded into mashed potatoes (or tossed with boiled or roasted new potatoes), mixed into cannellini beans as a side dish, spread on a sandwich, blended into dips, baked into bread, spooned into a baked potato, stirred into soup, mixed into dressings, or smeared on bruschetta. Get the idea? You can even use it as a substitute for tomato sauce on homemade pizza (go easy) or as a marinade, sauce, or condiment for meats. The possibilities are practically endless. Some folks even stir some pesto into their pancake batter for breakfast. Really, they do! Over the years, the traditional recipe for classic pesto Genovese has evolved to highlight the flavors of herbs other than basil. Modern chefs often start with a base of individual herbs like cilantro, dill, parsley, or mint; or, even use greens, like arugula or spinach. Sometimes, they combine milder herbs, like basil, with small amounts of intensely flavored herbs, like oregano or rosemary. Because the traditional recipe for pesto is very flexible and forgiving, it encourages experimentation. Getting creative might make the purists sneer, but who cares, right? It’s common to replace the pine nuts (a relatively pricey ingredient) with more budget-friendly nuts, like walnuts, cashews, or even sunflower seeds. You can also change up the flavor of your pesto by trying varying grades of olive oil, or oils from different parts of the world. Some are stronger, others are fruitier, and yet others have a peppery bite. The flavors are as diverse as the regions they come from. It’s staggering to think of all the different types of olive oils available today! Always use the best quality ingredients you can find (or afford). For example, instead of using some generic brand of parmesan cheese that comes in a can, look for genuine Parmigiano-Reggiano. Ideally, buy a block of cheese that you can grate yourself, so you’ll know it’s as fresh as possible. There’s no rule that says you’re limited to parmesan. You can choose any dry, aged cheese that has a rich, strong flavor. Believe it or not, classic pesto Genovese has one variation that won’t break tradition! It’s called “red pesto” and you make it by cutting back a bit on the herbs and adding sun dried tomatoes (or both sun dried tomatoes and red peppers). If you use our recipe exactly as written, you will make a classic pesto Genovese that’s out of this world! But if you’re a confident home chef, or just feeling a bit adventurous, why not improvise? Go ahead and try some of the substitutions we talked about above, using our recipe as a template. Good luck, and have fun! In the comments section at the very bottom of this page, let us know what changes you made to our recipe, and how your creation turned out. We can’t wait to hear from you!